Today is Friday the 13th, good fortune day, and good fortune appeared in the mail this morning — the 13th issue of Pinyon Review published by Gary and Susan Entsminger in Montrose, Colorado. The work of the Friebert family, (Steve, Eddie, and Stuart) is featured in both original and translated poetry, highlighted by the wonderful cover and title page art by Steve Friebert — an arresting piece called “Moon Art.” The royal blue background with scattered small red splashes in the design is accentuated by a moon with black branches overlaying it and, at first glimpse, I thought I was looking at the crown of thorns of the Crucifixion. I’ve looked at the work at least five times and still perceive the work as having spiritual form. However, not to be eclipsed by Steve Friebert, Stuart Friebert offers another of his translations of German poets: that of Ute Von Funcke’s poem entitled “Twilight,” a succinct poem of five couplets: “the small horse/of twilight/day’s waning/in its mane/it paws at the/sills of night/atremble, its play of muscles/cuts a hole in the fence rails of time/night’s already resting/in the saddle of silence.” Ute Von Funcke wrote plays for children before her debut as a poet and has now published four collections of poems. 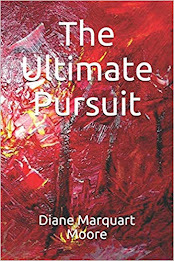 For me, the minimalist style reflects her background as a children’s playwright and is also reminiscent of poems recently published in Bayou Song by Margaret Simon, a book by a New Iberia, Louisiana writer I recently reviewed this month that reflects Simon’s background of working with gifted children in Louisiana. Fabric Poussin, a writer and photographer, whose work has appeared in more than 200 art and literary magazines in the U.S. and abroad, contributes a three-page display of “Frozen Dreams,” which includes an impressive piece, “Next Creation.” The artwork contains two open books that suggest Scripture is being re-created against the backdrop of a paintbrush and vivid patches of color — an unusual still-life that conveys the idea of co-creation. Michael Miller, the new bard of Amherst, reminds me of Emily Dickinson, minus the dashes, and with usual self-awareness, he speaks of aging and dying in his concise style. In his poem, “Seven in the Morning,” he writes of blurred vision and cataracts where “Reality draws me/to diminishment…With my fountain pen/I draw a feather for you./I might never see/A bluebird again.” Pinyon has published two of Miller’s books of poetry: Lifelines and In the Mirror; his work is also reminiscent of W. H. Auden’s direct style and suggests ease within his language — watchful and re-envisioned. Two of my poems appear in Pinyon Review # 13, and I’m always honored to be included among the many award-winning poets and artists in this artistically created journal. Outstanding writers also featured: Rob Walton, Rebekah Bloyd, Debra Bacharach, Neil Harrison, John Miller, Bruce Lader, Edward J. Rielly, John Abbott, Ed Meek, Thomas Els-on… and artist Sharon Johnson. 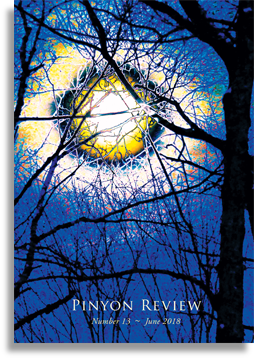 Pinyon Review #13 is a thought-provoking compendium of poetic voices and forms — a tour de force and a joy to read. I’ve been connected with the Entsmingers on this literary journey for nine years and am always amazed at the excellent quality of their productions.